Wow! The day has arrived! This is what happens before the bride arrives! The day you have dreamed about, planned, laboured over every minute decision, primped and primed for, has finally arrived. 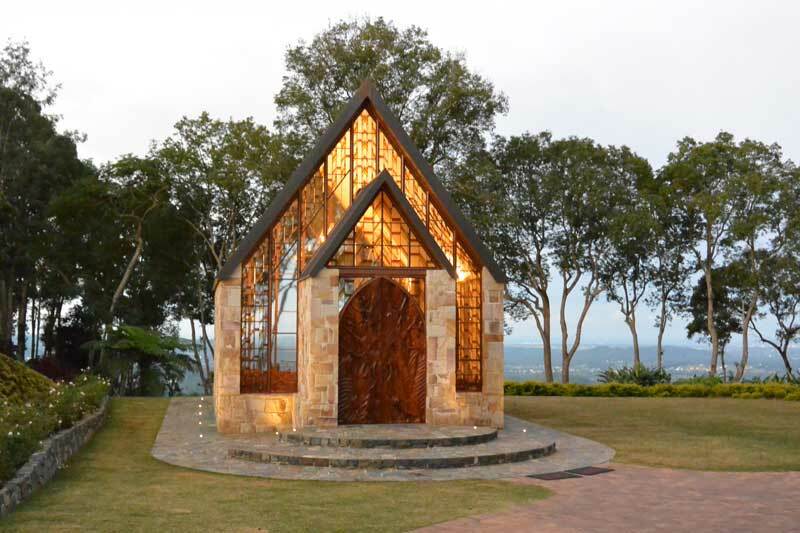 Even though it is the first day of Spring, the decision to have the ceremony in an air conditioned chapel in the heart of Montville, is the perfect choice. Guests arrive, mesmerised by The Chapel’s beauty, stunning views, stonemasonry, wood carvings and stained glass, but are happily chatting, reuniting with friends and family whilst enjoying refreshments from the lemonade stand in the manicured chapel grounds.….. All your wedding professionals are here, the musician is keeping the guests entertained, the photographer is buzzing around taking photos. As a typical modern day groom – you have enjoyed having a say in all the important wedding decisions that concern you, contributed to the ceremony with your own view on the journey so far; your feelings about to be shared with your closest family and friends as you speak your own vows. You have gone to the gym, for months, dropping those extra kilos, and the barber for the wedding shave and “do”. The suit fits impeccably, shirt pressed, shoes polished. The boys have a joke around getting ready, the call to arms rally done, and the “man processional” entrance into the chapel after the guests have settled into their pews evokes applause, cheers and laughter. Even with the delay in entering the chapel, it feels like an eternity up the front of the guests. Thank goodness mum and dad are sitting close, along with granny and Uncle Tom. The butterflies turn into moths, and then … bats. The celebrant checks with you again, “Are you alright?” You think you might faint! You have forgotten everything discussed at the rehearsal – she says it doesn’t matter, she’s got your back. The musician is playing but you don’t even hear it. Umbrellas appear outside shading the view from the windows of the chapel - the bridesmaids and bride are arriving. Your stomach does a backflip, you are ready to run. Finally, guests are invited to stand, the chapel doors open, and the processional begins. Three bridesmaids, one by one, glide down the aisle and take their positions. You can’t even see them through misty eyes. Then, when you gaze down towards the entrance, ready for your first glimpse of the bride, the chapel doors close. Your heart sinks, forgetting that it was all part of the plan to get the bride into position. That minute seems to last an hour, your palms go sweaty, mouth dry, and then the doors open again, revealing … an Angel! Written by CCN Celebrant Karen Faa – celebrant with 22 years experience, still captivated by the magic of love.